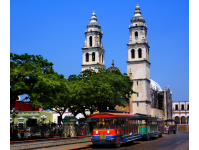 San Francisco de Campeche was founded in 1540 and it is the capital of the Mexican state of Campeche. It located on the shores of the Gulf of Mexico, 177 kilometers (106 mi) southwest of Merida and 387 kilometers (232 mi) northwest of Villahermosa. It is renowned for being one of the few walled cities in the Americas and the only one in Mexico. Campeche houses plenty of historic buildings, monuments, and fortifications, famous for being one of the major port cities of the Viceroyalty of New Spain. It was declared World Heritage by UNESCO in 1999. The zone of monuments is divided into five areas: protection A, featuring plenty of historic buildings in 45 hectares (111 acres), such as the Cathedral of the Holy Immaculate and Toro Theater; the protection zones B-1 to B-4, which are the connection between the zone of monuments and the city; Zone C, an area to protect the zone of monuments; and perimeter D, which were swamps some time ago. The main attraction of Campeche is its colonial, military, and religious architecture, with an Urban Hispanic Baroque style. You can walk by the streets of this city, surrounded by 18th-century houses featuring Moorish and Spanish decoration and colorful facades. The historic center is framed by seven bastions, as well as by Puerta de Tierra Gate and Puerta de Mar Gate, rebuilt in the mid of 20th century; Fort of San Jose, San Miguel and San Francisco, and 500 meters (1,640 ft) of fence that still survive. Today, the citadels operate as museums, including Casa del Teniente Rey City Museum, the Mayan Architecture Museum, Baluarte San Carlos, and the Regional Museum of Campeche, Tukulna Artesian House, Fort of San Jose. There are beautiful beaches a few kilometers from San Francisco de Campeche. Bonita Beach is the closest beach and its has gentle waves to practice water sports or simply sunbathe and relax. A little further to the southwest of Campeche, you can find Seybaplaya Beach, with dark blue waters and large rock formations. Sihoplaya Beach, which also offers calm waves, is 39 kilometers (23 mi) from the capital. There are two archaeological sites in the surroundings of Campeche. Edzna is 60 kilometers (36 mi) away, Itzaes House, featuring 20 monumental buildings and one of the most interesting Mayan cities due to the technological advances found there; and Jaina, the House in the sea, known as a Mayan necropolis. Los Petenes Biosphere Reserve adjoins a portion of the city; there have emerged curious circular forms of vegetation, where many species of birds and mammals nest and it is ideal for ecotourism. Calakmul, recently declared World Heritage by UNESCO, is to the south of the state of Campeche and on the border with Guatemala. Calakmul is one of the largest Mayan cities, which hosts 6,750 structures and over more than 120 trails, set within Calakmul Biosphere, the largest tropical jungle of Mexico. Various fairs are held in the city of Campeche, such as the Bread Fair, in March; the Carnival, in February, celebrated for more than 450 years; the San Roman Fair, from September 14 to 30; the San Francisco Fair, from October 4 to 19; the Cultural Festival of the Historical Center in December; and the Campeche Expo in July.